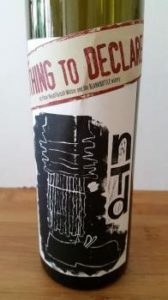 Pieter Walser of BLANKbottle, winner of the Grand Prix inaugural Wine Label Design Awards earlier this year (see here), has a fabulous white blend called Nothing to Declare (a tribute to the vine smugglers of days gone by) consisting of “mainly Marsanne with a bit of Roussanne, Grenache blanc, Viognier and Clairette blanche”. There’s very little primary fruit on the nose or palate but it has lovely presence and coated acidity. It’s oxidative but not overtly nutty or honeyed, rich but not unctuous. A wonderfully seamless, balanced wine. Exclusively available from Woolworths at R149.95 a bottle.